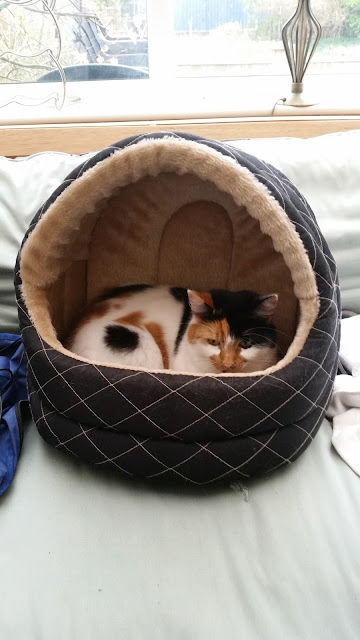 Nice and cosy in her cat bed. Introductions to Joni continue. It's a three steps forward, two steps back kind of situation, but I think we are seeing progress. I've looked back at old emails and reminded myself it took at least seven weeks before Belle and Dexter were getting along decently, and Joni has only been here for three, so it's early days still. I think it's fair to say the problem lies with Belle more than Joni. Belle is a highly strung cat, afraid of other cats, and tends to lash out if she feels cornered. Joni for her part seems curious about Belle but basically content to live and let live. Belle was much the same with Dexter at first, so given time we are hopeful she will calm down.